Have I mentioned lately how we love books? Seriously, we are constantly getting new books,going to the library and reading something with the boys. NHL is in first grade and likes to read books with history, science or things to learn. Yes, our first grader is slowly warping very nicely into a mini-Geek! When we were asked by Family Review Network to review the new National Geographic Kids: Weird But True! 300 Outrageous Facts book, we jumped at the opportunity. As a teacher, I had many National Geographic Kids books in my classroom, so I knew it would have amazing photos to share with my boys. At last, all those weird but true facts that readers of National Geographic Kids love so much are collected into a fun-filled book that you’ll come back to again and again! Peanut butter can be converted into a diamond? The world’s oldest pet goldfish lived to be 43 years old? The world’s longest soap bubble was as long as four school buses? On Neptune, the wind blows up to 1,243 miles an hour? An elephant’s tooth can weigh as much as a bowling ball? All of the facts in this handy book will amaze friends and family: Animals Superpowers, Chills and Thrills, Eat or Be Eaten, Mini and Mega, Wild and Crazy, and much, much more. Adjacent pages for such facts present a one-paragraph explanation of how that fact is possible or why it is so. Purchase your copy for $6.95. Both of the boys are fascinated with the photos within Weird But True. Yes, even my 2 year old will sit with the book for an extended time looking at all of the photos. JSL will chat away and call out all of the items that he recognizes. NHL, in first grade, will read the facts to me and then talk with me about what it says. Our conversations actually made me think about ways to use this book in the classroom. (I am always a teacher, even when on hiatus.) I could see the fun facts in this book being used as a prompt for classroom discussion and/or a writing exercise. In addition to this, the facts could easily create interest in a subject for kids to do more research on. Anything that excites children to learn gets a thumbs up from me. Thanks to National Geographic Kids, one lucky reader will win a copy of National Geographic Kids: Weird But True! 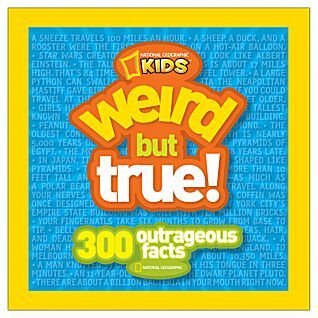 300 Outrageous Facts for your family. MAIN RULE – Answer the following questions: What is one weird fact about you that you are willing to share with others? 1 Bonus Entry – Who will this book be for if you win and why would they love to have it? 1 Bonus Entry – Leave a comment on any of my non-giveaway posts from the month of January/February/March. Be sure to leave a comment here to let me know which one. This Bonus entry may be done only twice per person. To enter, please follow the rules above within the comment section. Contest starts today March 10th and ends at 10:59 EST on March 24, 2010. You do not have to be a blogger to enter, but must leave a valid e-mail address for me to contact you for mailing address once the giveaway is over. I will select the winner using random.org and contact you via e-mail. You will have 48 hours to claim the prize. If there is no response, another winner will be selected. Open to U.S. residents only. Disclosure: This post was written for Family Review Network as part of a program for National Geographic, who supplied the book for review and giveaway. No other compensations was given. The opinions expressed in the review are my own feelings about the product. this would be for me and my sister. we love these type of fact books!! fun stuff. .-= Terri P.´s last blog ..Choose your own prize =-. This book, if I win it, will be given to my niece Lia. She loves reading and odd facts and I trust National Geographic so it’s a great combination!